Seton Hill University (SHU) is known for being a technologically advance university. Every incoming student is given updated Apple technology. The Information Technology (IT) department aids students and faculty with their technological needs. 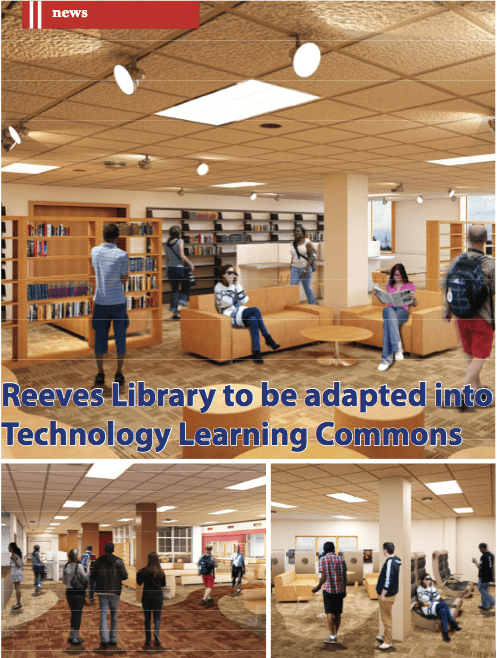 The IT department is moving from their location on the 4th floor of the Administration building to the library, turning the library into SHU’s new Technology Learning Commons. David Stanley, the director of Reeves library. Reeves Memorial Library will not be torn down, but will be “gutted” and completely renovated. The top floor will be the Learning Commons of the building. This floor will have the IT department, IT offices, library offices, a gaming room, the help center, and smaller rooms that student can reserve. The lower floor will be the library. “A popular rumor going around is that we are going to eliminate the library all together. That is not true! It is simply being relocated and updated. It’s the same library, same collection, same references but a different location,” said Stanley. “To support our technology and become a very visible part of the organization I like the idea of up- grading our library to become a 21st century learning commons that will include collaborative spaces and technology that will help facilitate that modality of learning,” said Phil Komarny, vice president and chief information officer. Currently, the first floor of the library is the main campus library, and the bottom is a lounge area that leads to the Lake Erie College of Osteopathic Medicine (LECOM) library. “The plans will not affect the LECOM library, they will remain a separate entity, and will not change” said Stanley. “The ability to create a communal space that is infused with technology and facilitates students ability to learn collaboratively is a differentiator that Seton Hill has and will continue to leverage. These learning spaces will continue to evolve, all in the mission of preparing students for life in a world that they will be living in. By embracing mobility, cloud and social, the three key aspects of computing today, Seton Hill has provided students, faculty and staff a platform to learn, educate and innovate,” said Komarny. Although the Writing Center; another campus provided reference for students is not moving to the new learning commons, the commons hopes to discuss with them about have occasional representatives come to the library to assistant students with help, according to library staff. “The learning commons is designed to encourage intellectual exchange between students and among stu- dents and faculty/staff, a place for small group interac- tion and study, and an environment for identifying and evaluating information resources as such increasing information fluency skills,” said Gawelek. “The plan for consolidation is that everything will work to make sure that the transition is smooth and that the service is always the best for our students. When moved, everything will look completely differ- ent and students and faculty will be pleasantly pleased and surprised,” said Stanley. No official date for construction to begin has been released, but according to Stanley, SHU hopes to start construction sometime at the end of the 2014 spring semester. ← ‘The Conjuring’ Review: Is it 3:07?